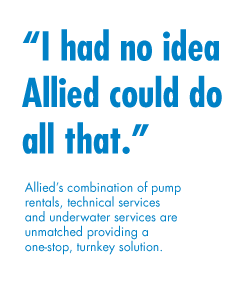 “I can rent pumps anywhere, but Allied knows wet and dry weather flows because of their experience and can choose the right pump for the job. They always put in the extra effort to determine the most cost-effective long term solution to the problem.” - Dave Kremer, Superintendent, Building Crafts, Inc.
Building Crafts, Inc. is a general contractor, specializing in wastewater collection and treatment plants. One of their clients utilizes an 18” gravity sewer line that follows the path of a creek bed, transporting waste downhill to a treatment plant. 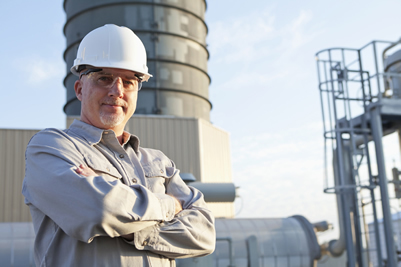 Late in the evening, Building Crafts was called by their client, whose monitoring system identified that intake flow at their treatment plant was too high. Upon inspection they found that the creek bed which this particular gravity sewer line followed had eroded, causing the pipe to be exposed. It had broken apart and 4 sections of pipe were damaged. Sewage was being released into the creek on the upstream side, and the 18” pipe submerged on the downstream side was picking up a lot of extra flow, triggering the alarm at the treatment plant due to the creek water inflow. In addition, the terrain where the broken pipe was located presented a challenge. There were 50’ banks on both sides of the creek, with railroad tracks on one side and woods on the other side. Building Crafts Superintendent Dave Kremer called Allied, who arrived promptly even though it was late in the evening. They worked 12 straight hours through the night in challenging terrain to get a short term bypass in place. They knew right away they needed to get flow back into the system, prevent pollution of the stream, eliminate the addition of flow from the creek into the system and create a short/term long/term cost-effective repair of the broken pipe. Allied plugged the intake approximately 2,000 ft. downstream, which stopped the flow of the creek into the system. They set up 2 - 8” pumps and installed a float-activated autodialer to provide notification of any pumping problem when the pumps were unmanned. Installing these pumps allowed them to return sewage flow to the collection system. They laid 2,000 feet of discharge hose through the woods in the middle of the night to reach the downstream manhole and prevent leakage into the stream. They utilized the pumps and hose as the short term solution, but quickly replaced this with a more cost-effective long term solution where they could again use gravity to establish flow. Building Crafts and Allied worked together as a team, but it is Allied’s service and expertise that causes Building Crafts to come back to them again and again.